I. What is Enemy Nations? A. What type of game is Enemy Nations? B. What is so new about Enemy Nations compared to other games? C. Who is creating Enemy Nations? II. What is the story behind Enemy Nations? A. What is to be included in the story-line? B. What races are available? III. What does Enemy Nations look like? A. How is the interface designed? B. What resolution will the game be in? IV. How is game play designed? A. How is the computer AI designed? V. What is the setting like? A. What is the appearance of the levels? B. What is different about the world? C. How does the economy work? VI. How is the multiplayer aspect of Enemy Nations implemented? B. What about Internet play? C. How many can play? D. How many maps/worlds are there? VII. What kind of hardware does Enemy Nations require? A. What does it run on? VIII. When is Enemy Nations expected to be released? Welcome to version 1.01a of the Unofficial Enemy Nations FAQ! Within this document I will attempt to provide the most complete, updated, and correct information about the game Enemy Nations as is possible. Please keep in mind that this FAQ is in no way endorsed or supported by Windward nor Viacom Entertainment. Questions, comments, corrections, complaints or anything else are gladly accepted at the address zielin@escape.com, or visit the Enemy Nations web site around at http://www.windward.net/enemy.htm. Q. What type of game is Enemy Nations? A. 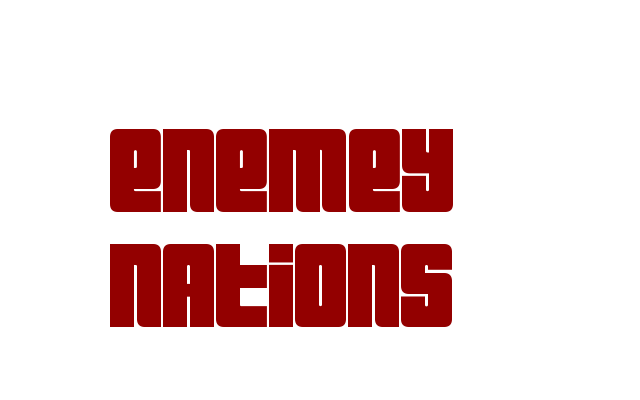 Enemy Nations is a resource management and combat game in the same genre as Serf City, Dune II, Warcraft, & Command & Conquer. However, it is a much more rich (and complex) model. Q. What is so new about Enemy Nations compared to other games? Q. Who is creating Enemy Nations? Q. What is to be included in the story-line? the best man, woman, or thing win. Q. What races are available? would all own P/200s with 32M of memory)..
Q. How is the interface designed? A. It's windows, but it doesn't look like windows. It will draw every pixel on the screen. variable windows to keep an eye on the action wherever you want. Q. What resolution will the game be in? Q. How is the computer AI designed? is maintained at the goal manager, player, map and OpFor (Operational Formation) levels. enhancements to the AI and can be reached at edybs@ix.netcom.com. a lot harder or easier than wanted. It will also sometimes do incredibly dumb moves. Q. What is the appearance of the levels? twelve terrain types. Mountains may fade into plains, which may fade into deserts. with no convenient "flat planet" map corners in which to build up a strong defense. fall upon an unsuspecting enemy. Q. What is different about the world? to but it goes well beyond the stair-step effect of SimCity 2000. Q. How does the economy work? therefore an attack that hurt buildings has a noticeable affect right away). damage, terrain type, and more. Play as one more protocol). Q. What about Internet play? server and waits for a response before moving. size. The more players the bigger the world (so you aren't all in each other's back yard). going to run till it runs out of memory - so you won't be allowed a number that high). Q. How many maps/worlds are there? significantly different map. Everyone has been saying they want something more real. Something where, you can't nail the trick to each scenario and then walk through it. Well... we'll see if people actually like it being a new challenge each game. trivial calculation to know what needs to be drawn at a given location. Q. What does it run on? is the final art in a couple of places. The game is ALMOST done. have no full zoomed graphics, only 256 colors, and no digital sound. The former is better because the link is much faster…. * Thank you for using The Unofficial Enemy Nations FAQ 1.01a and have a nice day.